Go to the Bulk section of your account. Click the Access button in the Email Finder section. Set a List Name in the text box and create a .csv file using only commas or semicolons as column delimiters. 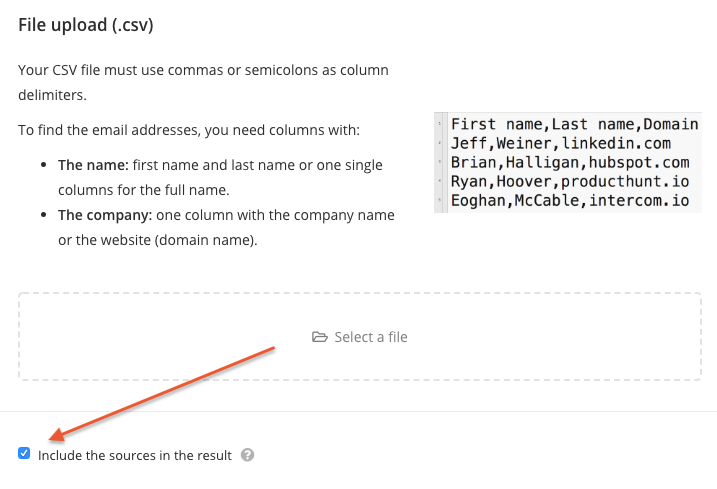 Your .csv file should contain the first name and last name (or one single columns for the full name) and the company or website (domain name) in another column. Choose the .csv or .txt file you want to use for the email finder and hit upload. You’ll now have to match the columns with the fields in the drop-down menus. Please check The first row is for the headers box if needed. Select Download and save the file. Open the file in Excel or a similar software. If this option is checked, the URLs of the sources will be included in additional columns. Only the active sources where the email address can still be found are returned. Email address: this is the email address found by Email Hunter. Confidence score: an indicator for the deliverability of the email (in %). Check that all required fields are completed and do not mix domains with company emails. Just choose a method and apply it to the whole document. If using full names, ensure that middle names are removed as only the First and Last name is required. Ensure that all rows do not contain blank cells. No names, company name or domains should be empty. If using company names make sure to remove additional characters such as LLC, brackets, slashes, that are not allowing Hunter to extract the correct company name. A good company name is "Company" and not "Company Ltd". Use domains when possible instead of company names as this will guarantee the best performances in Hunter. 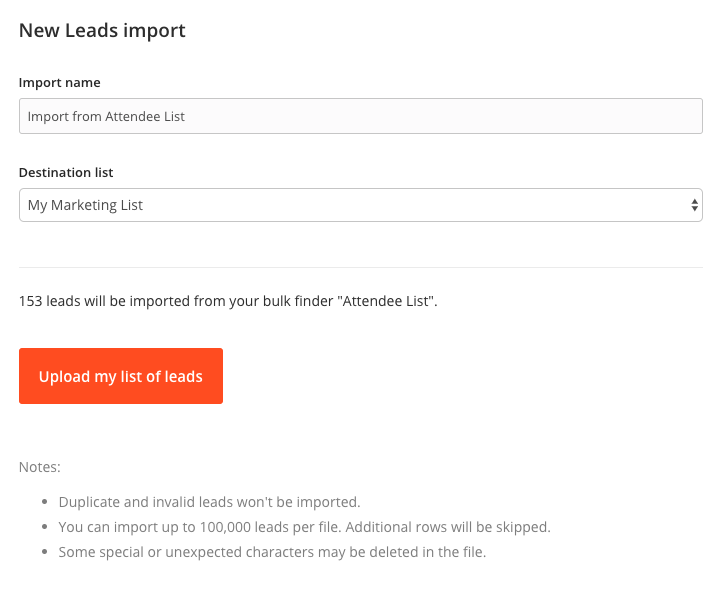 Emails resulted from the Bulk Email Finder can now be imported as Leads in a few steps. After processing a Bulk Email Finder click the "Import as leads" button. Set a name for the import, choose the destination list of Leads and when you are all set click the "Upload my list of leads" button. 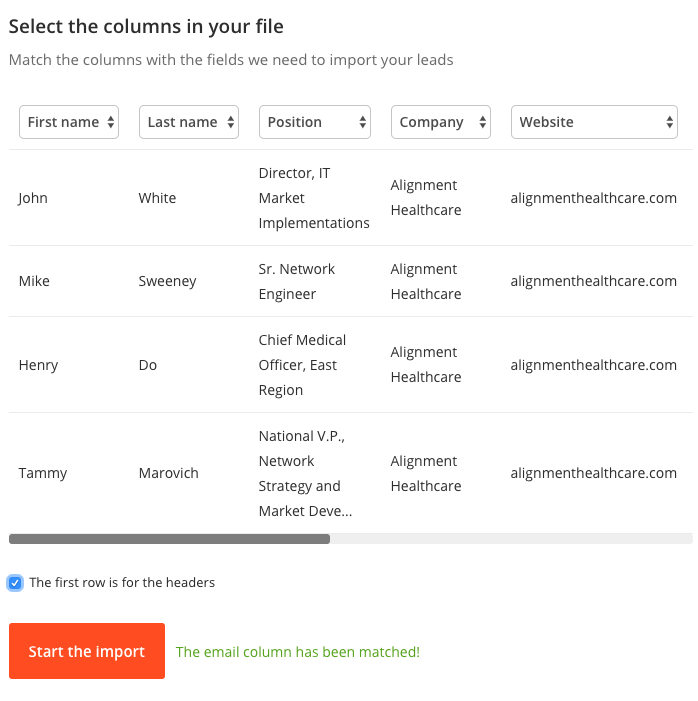 Configure the columns that you want to import and click the Start import button. Hunter will process the import and add the leads resulted from the Bulk Email Finder in the selected list of leads. The Bulk Email Finder functionality help you to find the email address of a specific person. To do this it only requires the first/last name of and the website or domain of the person you are looking for. It's recommended to use the domain name instead of the company name. You can find up to 150,000 email addresses per file. Additional rows will be skipped. Make sure to avoid using special characters as they may be deleted in the file.